Trying to get quality rest in a bed that’s the wrong temperature is not just irritating, it can have a detrimental effect on your health over time. Sleeping too hot or too cold at night can worsen or add to pain from conditions like fibromyalgia. 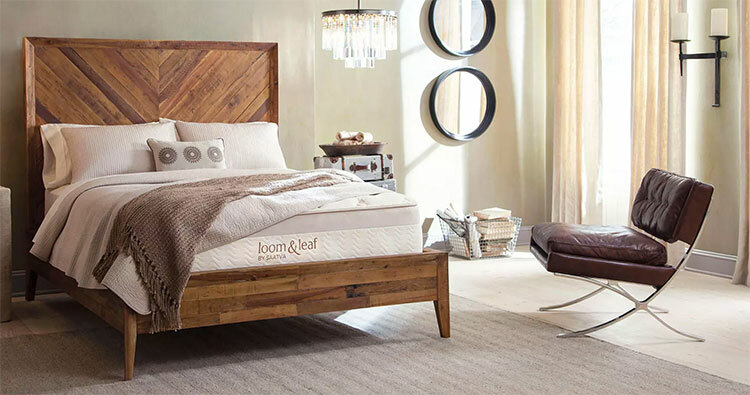 The Loom & Leaf Relaxed Firm Mattress is our top pick for the best memory foam bed. While it does create a sinking feeling like other memory foam mattresses, you won’t melt too far into it. This, along with some other cooling factors present in the mattress, will probably prevent you from getting hot. Why are You Sleeping Too Hot or Too Cold? Our top pick for the best bed for temperature control is the Loom & Leaf Relaxed Firm mattress due to its convoluted egg crate design, cooling gel, and breathable organic cotton cover. Keep reading for a full review on this bed and our other top picks. Do you wake up sweaty in the night? 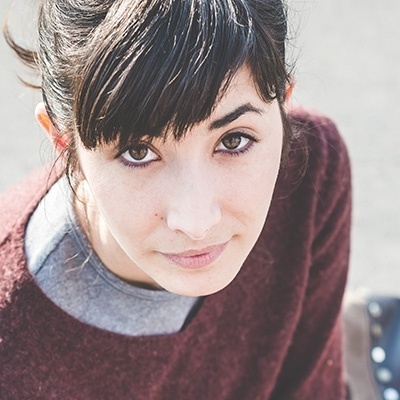 Do you have cold feet that make it hard to fall asleep? Then it’s about time you found a solution. Trying to get quality rest in a bed that’s the wrong temperature is not just irritating, it can have a detrimental effect on your health over time. Sleeping too hot or too cold at night can worsen or add to pain from conditions like fibromyalgia. Since getting good rest is so important for pain management, sleep temperature is especially important if you suffer from such a health condition. Even if you don’t have a health condition, getting good rest is crucial. This article will show you the reasons behind why you may be sleeping too hot or too cold and offer you some solutions for fixing it. Mattress Material: Some types of mattresses are known for allowing you to sink into the bed (like memory foam), which can make you feel warmer. Other beds, like innerspring or latex mattresses, allow you to rest on top of the bed, promoting more airflow and keeping you cooler. These days, though, the mattress industry is competitive and most modern manufacturers use cooling technology, regardless of materials used. Blankets and Sheets: Using a heavy comforter will make most people overheat unless it’s wintertime. Cotton is more breathable than flannel or synthetic fabrics and some people get hot easily and will do better with thinner sheets, no matter the season. Body Weight: How much a person weighs can impact how warm a bed feels. Fat acts like a blanket on the body, so overweight people tend to get hot easier than thinner people. In addition, people who carry extra weight may sink further into their bed, making them experience the mattress as warmer. There are a few other factors that can impact how hot or cold you feel, too, and what feels comfortable as you drift off to sleep at 11 pm may end up feeling too warm at 3 am, causing you to wake up. Since sleep is so important for your quality of life, you’ll want to make sure your bed is contributing to that. Let’s look closer at the way your bed impacts your sleeping temperature. Although the temperature of your room and your body type both contribute to the sleeping temperature, your mattress also plays a major role in this. If you struggle with getting comfortable at night due to feeling too hot or cold, it’s important to know the difference between materials. Below, we’ll cover the differences between the most popular mattress materials and include a great option for each. Compared to other mattress materials, latex is reported by users to sleep cool, though this does depend on specific factors. Latex beds with cotton or wool covers tend to be cooler because they enhance breathability. Synthetic latex might feel warmer, while natural latex doesn’t retain as much heat. And beds that use both memory foam and latex tend to be hotter. As far as latex mattresses go, it’s hard to beat the Avocado Green Mattress. Designed in New Jersey and made to order in California with non-toxic materials, this bed could be a good fit for someone who sleeps too hot. Latex is hypoallergenic (resistant to dust mites and mold), so it should work well for sensitive sleepers. There aren’t any flame retardants or other harmful chemicals used in this bed, so if you tend to react to allergens, that’s a huge plus. 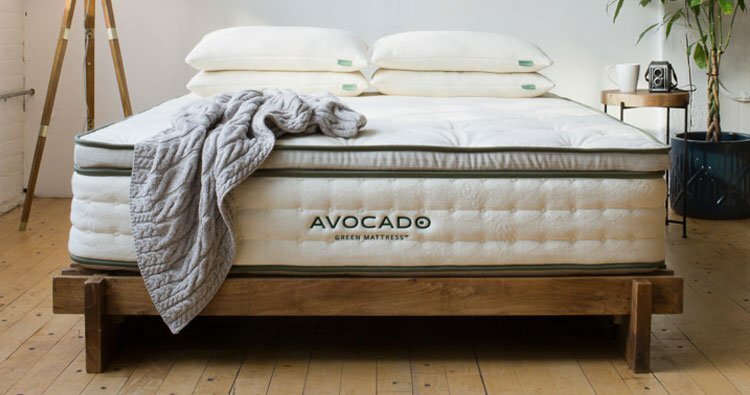 The Avocado Green Mattress uses natural Dunlop latex, which is known to sleep cool, and New Zealand wool to promote airflow. If you struggle with body pain in addition to sleeping too hot, you’ll probably appreciate the zoned pressure point support system in the Avocado Green Mattress. This keeps the back, shoulders, and hips properly supported and aligned and works for all sleeping positions. The bed comes with a 100-night sleep trial and a full replacement value warranty for the first 10 years. Overall, people who know they want a latex bed and also want an environmentally sustainable bed should be happy with this mattress. Compared with non-foam beds, memory foam does have a reputation for sleeping warm. 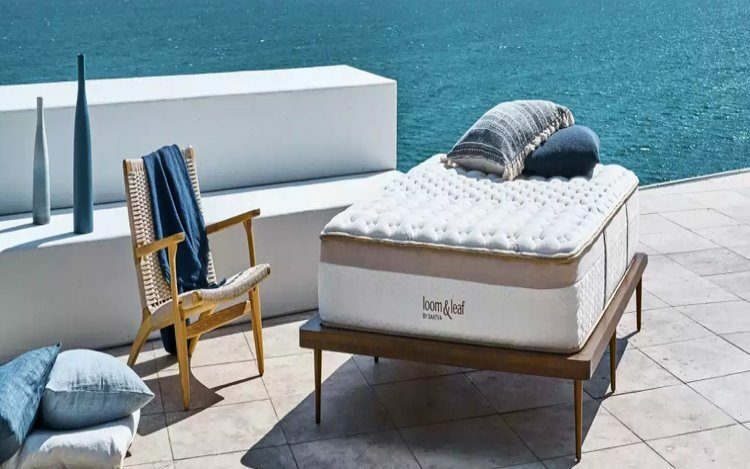 However, this varies greatly depending on the brand, firmness level, mattress model, and specific type of foam used and most modern manufacturers have found ways to combat the heat retention issue. Gel-infused foam layers, open-cell foam, (which lets more air through), and even copper can all contribute to making a memory foam bed cooler. Breathable materials in the mattress cover can also help keep sleepers from getting too hot. As mentioned above, it’s worth keeping in mind that memory foam comes in a variety of firmness levels. While this material does create sinkage, how far you’ll sink in depends on a number of factors. A softer memory foam bed is more likely to feel hot compared to a firm bed. The Loom & Leaf Relaxed Firm bed doesn’t have much bounce to it and works well for side sleeping since the foam cradles the shoulders and hips in this position. The firm surface is supportive enough for back or stomach sleepers and supports combination sleepers well, too. As far as cooling technology goes, the Loom & Leaf Mattress uses a convoluted (egg crate-shaped) design to promote airflow, along with cooling gel. 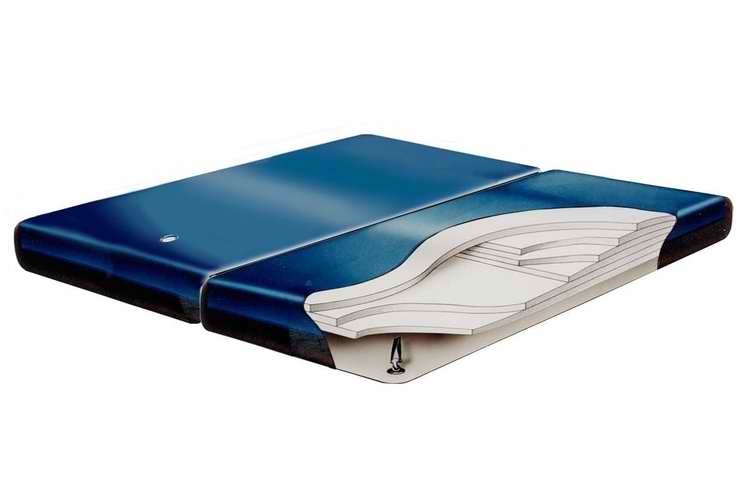 It also uses a breathable organic cotton cover. This bed should work well for body pain since it provides cradling sinkage, in addition to firm support. Memory foam is the best of the best when it comes to absorbing motion, so couples should sleep soundly on the Loom & Leaf bed. This mattress is CertiPUR-US® certified, which means it’s free from harmful levels of toxic chemicals or heavy metals. If you live alone, you can request White Glove Delivery, which means professionals will both deliver and install your Loom & Leaf Mattress. It comes with a 120-night sleep trial and a 15-year warranty. Hybrid mattresses have a layer of metal springs underneath a layer of fiber and/or foam. These beds combine the comfort and pressure relief of foam with the bouncy support and airflow of coils. How hot or cool an innerspring bed will sleep depends on the materials used, in addition to the layer of coils, but most hybrid mattresses have cooling technology in them. 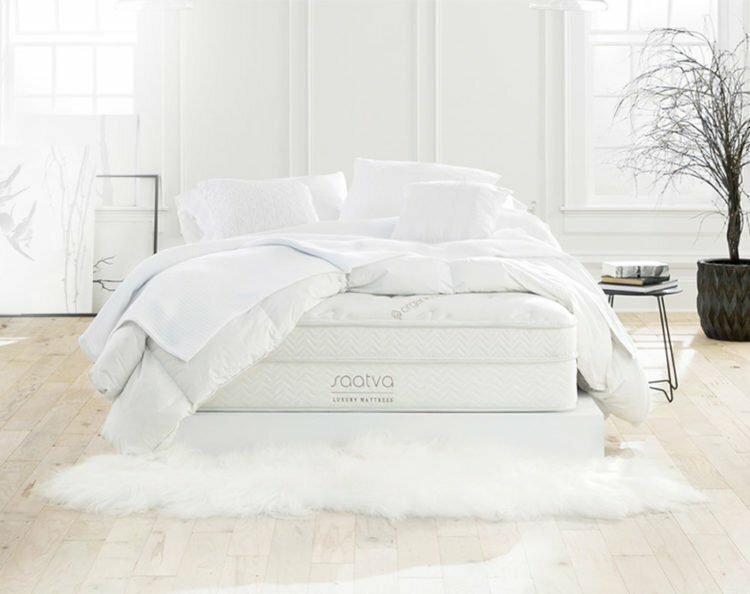 Saatva drew inspiration from the traditional coil mattress design and added modern upgrades. This brand uses two layers of coils for a deep bounce. The coils are individually pocketed to reduce motion disturbance and to add contouring to the bed. The bed also has enhancements in the lumbar region for people with lower back pain and a Euro pillow top to relieve pressure. Customers can choose between an 11.5-inch or 14.5-inch high model for this bed and it also comes in three firmness levels: Plush Soft, Firm, or Luxury Firm. This bed could be a good choice for people who struggle with sleeping hot and also want a bouncy bed. You’ll sleep more on top of this mattress than in it. The bed uses eco-friendly, CertiPUR-US® certified materials that were found to be free from dangerous levels of toxins. The Saatva mattress has durable stitching and strong materials with supportive edges. While the mattress works for all sleep positions, stomach sleepers might find it especially supportive because the coils will properly support the lower back in that position. Overall, you might like this mattress if you don’t want to have to choose between contouring pressure relief from a pillow top and airflow and bounce from a layer of coils. People who order the Saatva Mattress will get free installation and free mattress removal for their old bed. Waterbeds are often thought of as a retro concept, but many people still use them comfortably today. Waterbeds are likelier to sleep cold than hot, so they might suit someone who has a really serious issue with overheating. The water in a waterbed will adapt to the temperature of the room and absorb the body heat of the sleeper. Some users will want to use a waterbed heater for their bed if they find themselves sleeping too cold. The Dual Sea Cove Waterbed Mattress is a waveless water bed, meaning that it provides motion reduction for sleepers. When you sleep on a waterbed, the weight of your body is lessened and your body can relax. People who struggle with allergies will likely benefit from a waterbed because bacteria can’t penetrate the material. The bed works well for couples since there are two included bladders that allow you to adjust the firmness level. The mattress is made from durable virgin vinyl and reinforced corners. The Dual Sea Cove Waterbed should be used with a hard-side wooden box frame for best results. If you sleep cold at night, you can try using a heated mattress pad or an electric blanket. Before using an electric blanket, you’ll want to make sure it’s compatible and safe to use with your mattress. Asking the manufacturer is one way to find out. In addition, you can use a heavier blanket to keep you warmer and switch to flannel sheets instead of cotton. In addition, you might want to consider wearing socks to bed or using a foam topper on top of your mattress. If you tend to sleep too hot at night, the best thing you can do is select a mattress that has cooling technology. Fortunately, these features are becoming more and more common in modern mattresses. In addition, you can switch to breathable sheets, like cotton or bamboo. You might also try seeking out a mattress that has a moisture-wicking cover, designed to keep the sleeper cool. If you get too warm in your sleep, try to use lightweight covers and keep your hands or feet outside of the blanket, which can cool you down. Keeping your bed at the best temperature for your needs is important and can completely change how you sleep. It is worth giving some serious thought and may require a bit of trial and error until you find the best solution for you. PrevPreviousTypes of Beds Guide 2019: 44 Different Kinds of Beds – Which One Is For You?